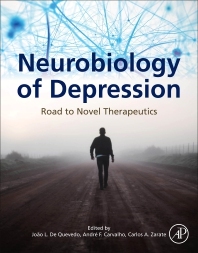 Neurobiology of Depression: Road to Novel Therapeutics synthesizes the basic neurobiology of major depressive disorder with discussions on the most recent advances in research, including the interacting pathways implicated in the pathophysiology of MDD, omics technologies, genetic approaches, and the development of novel optogenetic approaches that are changing research perspectives and revolutionizing research into depression. These basic foundational understandings on the neurobiology underlying the disorder, along with a comprehensive summary of the most recent advances in research are combined in this book to aid advanced students and researchers in their understanding of MDD. Depression is one of the most common mental-health disorders caused by a variety of genetic, biological, environmental and psychological factors. Major depressive disorder (MDD) is typically treated with first-line antidepressant agents that primarily target monoamine neurotransmission. However, only approximately one-third of patients with MDD achieve remission following a trial with such an antidepressant. Furthermore, MDD is a heterogeneous phenotype, and new frameworks, such as the NIMH Research Domain Criteria (RDoC) may provide a more accurate, biologically based comprehension of the symptomatic heterogeneity of this devastating illness. Elizabeth D. Ballard, Ioline D. Henter and Carlos A. Zarate, Jr.
Muir J. and Bagot R.C. Forbes M.P., Jaksa P., Eyre H.A. and Bousman C.
João Quevedo is Professor of Psychiatry at the McGovern Medical School, The University of Texas Health Science Center at Houston, where he is Vice-Chair for Faculty Development and Outreach, Director of the Translational Psychiatry Program, and Director of the Treatment-Resistant Mood Disorder Program. Before moving to Houston he was Dean at the University of Southern Santa Catarina Medical School, Criciúma, SC, Brazil, where he is still Adjunct Professor of Psychiatry. He is also an 1A research fellow (the highest level) of the National Council for Scientific and Technological Development (CNPq), Brazil; an affiliate member of the Brazilian Academy of Sciences (an award given to the most notable researchers in Brazil under the age of 40), associate editor of the Revista Brasileira de Psiquiatria, vice president of the Santa Catarina State Association of Psychiatry, and Director of the Continuous Medical Education Program in Psychiatry (PROPSIQ) of the Brazilian Association of Psychiatry. Dr. Quevedo’s research interest is the neurobiology of psychiatric disorders, particularly mood disorders, and he is a specialist in animal models of depression and bipolar disorder. He is author of nearly 500 publications and 6 scientific books. André F Carvalho is associate professor at the Department of Psychiatry at the University of Toronto and a clinician scientist at the Centre for Addiction and Mental Health (CAMH). He was elected member of the board of councilors of the International Society of Bipolar Disorders (2016-2017) and the vice-chair of the section of private practice psychiatry of the World Psychiatric Association (2015-2017). He sits on the editorial board of several international peer-reviewed journals, including Psychotherapy and Psychosomatics, and has served as a peer reviewer for several leading journals and funding agencies. He is an expert in mood disorders, psychiatric epidemiology, and evidence-based mental health. Dr. Carvalho is a sought after speaker in several national and international meetings, and is the author of over 300 publications. Carlos A. Zarate, Jr., is Chief, Section on the Neurobiology and Treatment of Mood Disorders and Chief of Experimental Therapeutics and Pathophysiology Branch (ETPB) at the National Institute of Mental Health, and Clinical Professor of Psychiatry and Behavioral Sciences, at The George Washington University. Dr. Zarate completed a Fellowship in Clinical Psychopharmacology at McLean Hospital from 1992-1993, after which he remained as a staff member until 1998. At the McLean Hospital Consolidated Department of Psychiatry, Harvard Medical School, Dr. Zarate was the Director of the Bipolar and Psychotic Disorders Outpatient Services, Chair of the Pharmacy and Therapeutic Committee, and Director of the New and Experimental Clinic. From 1998 to 2000, Dr. Zarate was the Chief of the Bipolar and Psychotic Disorders Program, Associate Professor of Psychiatry, and Chair of the Grand Rounds Committee at the University of Massachusetts Medical School. In January 2001, he joined the Mood and Anxiety Disorders Program at the NIMH as Chief of the Mood Disorders Research Unit. In 2009, Dr. Zarate formed the Experimental Therapeutics and Pathophysiology Branch at the NIMH. He is the recipient of numerous awards and the author of more than 250 publications.